I don’t know about you, but I’m used to being able to customize the operating systems that run on my gadgets. I like to be able to tweak a few things here and there on my Mac especially the things I have to look at all the time like my desktop background and screen saver. If I wasn’t able to do these things I think my Mac would be pretty boring. I used to think the same thing about my iPhone until now. Apple’s release of iOS 4 introduced us to something people using jailbroken iPhones have been taking for granted for a long time — the ability to alter the wallpapers used on the iOS Springboard desktop and lock screen. Couple these iOS enhancements with the new iPhone 4 retina display and soon you’ll be feasting your eyes on some pretty amazing wallpapers. So where do you go to find good wallpapers? The answer to that question is that you have options. If you are creative you would probably enjoy creating your own wallpapers using your own photos, i.e. 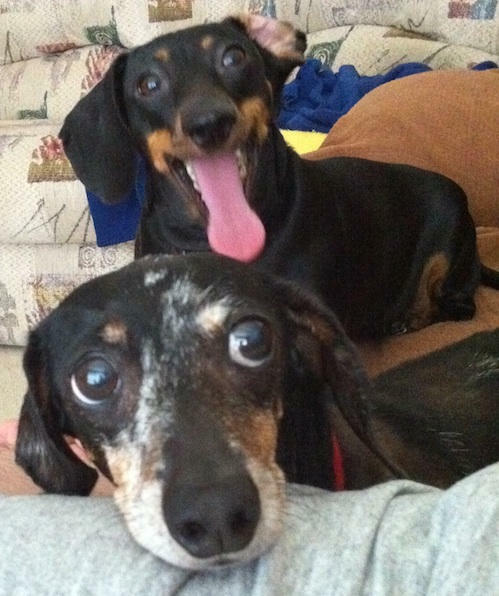 like two of my best friends begging for just a wee bit of ice cream, captured by my iPhone 4 camera. Or you could find available photos and crop them down to the 960×640 retina display resolution using your favorite photo editing application. The iTunes App Store has a number of free ad-supported apps available in the Store that offer free wallpapers and we’ll take a look at a few of these here. Retina Wallpapers HD (iTunes Link) offers over 10,000 plus 960×640 HD wallpapers for the Retina display on the iPhone 4. The app offers new wallpapers daily and takes full advantage of the iOS touch interface so that you can easily browse through wallpapers using swipe, zoom and pinch gestures. The app also offers some social media features where you can share your favorites on Facebook, Twitter, or by e-mail. 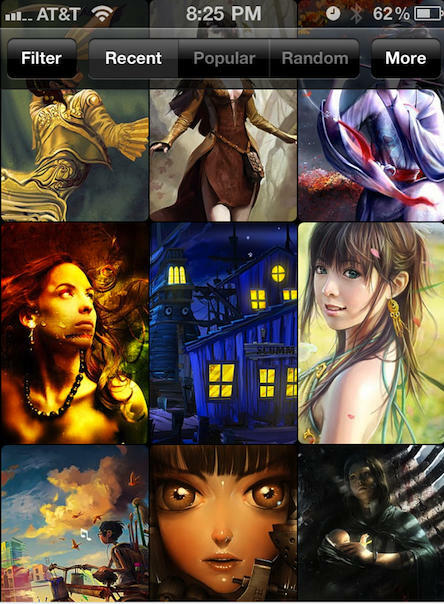 You can even upload your own wallpapers so that others might enjoy them. iWallpapers HD (iTunes link) offers a large number of wallpapers. The app also claims to offer new wallpapers daily and it also takes advantage of the iOS touch interface so that you can easily browse through its collection of wallpapers. It has one GUI aspect that I like that Retina Wallpapers HD did not have and that was the screen below. 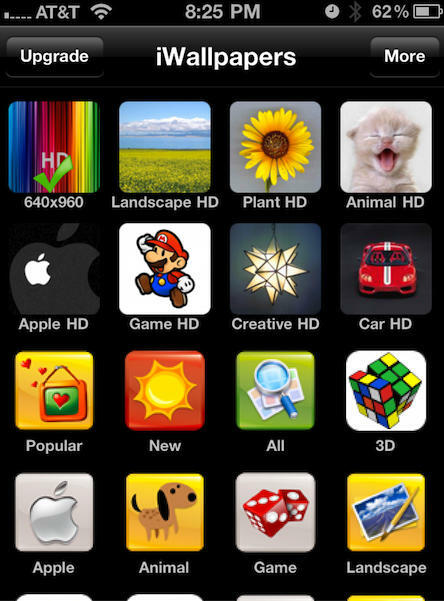 You could easily find wallpapers by topic and the HD ones were separated from the non-HD ones. This app did not offer any social media features with the exception of sharing wallpapers with the other iWallpapers HD users around the world. However, contributors could earn points that would eventually allow them to upgrade to a non-ad supported version of the app. You can find a number of impressive retina display compatible wallpapers for your iPhone 4 (or wallpapers for other iPhone models) on the internet. Here are links to a few of my favorite free wallpaper sites below. There are a plethora of wallpaper apps in the iTunes App Store and some of them even cost money, but I’ve only downloaded the two free ones above. Regardless of which app you choose you won’t go away empty-handed due to the large amount of content you can access through these apps. You could spend a lot of your free time looking for something, but luckily the wallpapers are sorted by theme which speeds things up a good bit. I did not observe or spend time looking for content overlap, but I did decide that I liked iWallpapers HD better, because of the one element of its GUI that I mentioned above, which happened to be unique between the two apps. I’ll keep both of these apps handy to flip through once in a while, but I think overall the best wallpapers I’ve found so far are ones I’ve made myself or ones that I’ve heard about on the internet. If you’ve found a nifty source of retina display compatible wallpapers on the internet, from friends, or inside of another app tell us about it in the comments.